Bolzano (German: Bozen, historically also Botzen; Ladin: Balsan or Bulsan; Latin: ) is the capital city of the province of South Tyrol in northern Italy. Bolzano is the seat of the Free University of Bozen-Bolzano, where lectures and seminars are held in English, German and Italian. The city is also home to the Italian Armys Alpini High Command (COMALP) and some of its combat and support units. It is one of five mainly Italian-speaking municipalities in the Germanic province of South Tyrol. In a 2010 quality-of-life survey by the Italian newspaper Il Sole 24 Ore, Bolzano was ranked first among 107 Italian cities on the surveys list. In the 2011 edition of the survey, Bolzano was ranked number two and came after the top-ranked Bologna. 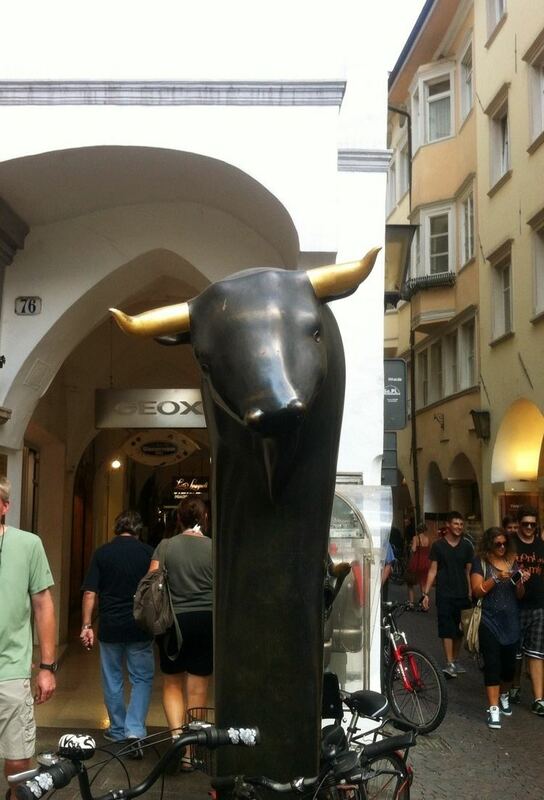 In the 2012 edition, Bolzano regained the top place as the city with the Best Quality of Life in Italy. During the gradual decline of the Romans influence in the 7th century, Bavarian immigration took place and the first mention of a Bavarian ruler in Bolzano dated from 679. At that time, the Bavarians named the nearby villages around Bolzano Bauzanum or Bauzana. German populations have been present in the region of Tyrol since this time. In 1027 the area of Bolzano together with the rest of the diocese was conferred, by the emperor Conrad II from the Salian dynasty, upon the bishops of Trent. In the late-12th century, the bishop founded a market town, along the Lauben thoroughfare. The town therefore became an important trading post on the Transalpine Augsburg-Venice route over the Brenner Pass, elevation 1,371 metres (4,498 ft) above sea level, within the Holy Roman Empire. From the 14th and 15th centuries onwards, a large market fair was organised four times per year to greet tradesmen and merchants en-route the Brenner Pass. The Mercantile Magistrate was therefore founded in 1635 by the Austrian duchess Claudia de Medici. During every market season, two Italian and two Germanic officers, who were appointed among the local tradesmen, worked in this magistrate office. The establishment of an official trade organisation strengthened Bolzano as a cultural crossroad in the Alps. After the dissolution of the Holy Roman Empire in 1806, Bolzano became part of the Napoleonic Kingdom of Italy and was incorporated into the Dipartimento Alto Adige. After the Congress of Vienna (1814-15) Bolzano returned to the County of Tyrol, within the Austrian Empire and subsequently the Dual Monarchy of Austria-Hungary in 1866. The County covered both modern-day South Tyrol and the Federal States of Tyrol and East Tyrol in Austria. No fighting took place in the County of Tyrol during the First World War. Germany and Austria-Hungary, however, lost to the Entente and signed an armistice in 1918. The transfer of South Tyrol to Italy took place in 1919. At the time of Bolzanos annexation by the Kingdom of Italy, the town was settled primarily by a German-speaking population. As of 1910, 29,000 inhabitants were German-speaking and only 1,300 Italian-speaking. In the 1920s, along with the rest of South Tyrol, Bolzano was subjected to an intensive Italianisation programme under the orders from the Fascist leader Benito Mussolini. The aim of his programme was to outnumber the local German-speaking population by tripling Bolzanos population with Italian-speaking immigrants drawn from the rest of the country. In 1927, Bolzano became the capital of the province of South Tyrol. In 1933, Adolf Hitler came to power in the Weimar Republic. There was worry among Mussolini and the Fascists that Hitler, in facilitating his extreme ideology of all ethnic Germans under one Reich, would reclaim South Tyrol from Italy. Consequently, Mussolini and Hitler secured an agreement, the Option Agreement, in 1939. Hitler would renounce his claims over South Tyrol as Germanys Lebensraum (living space). Nevertheless, those Germans who opted to stay in South Tyrol and refuse to relocate to the Third Reich would be regarded as traitors and subject to a full-scale Italianisation. During the Second World War, Bolzano was the site of the Nazis Bolzano Transit Camp, a concentration camp for persecuted Jews and political prisoners. After 1943, heavy fighting against Nazi Germany and the Axis Powers took place in the Dolomite Alps once the Allied Powers had liberated Italy. After the War, independence movements gradually gained popularity among the Germanic population in Bolzano and South Tyrol. In the 1960s, a series of terrorist attacks and assassinations were carried out by the South Tyrolean Liberation Committee – a German secessionist movement – against Italian police, officials and infrastructure facilities (one notable incident being the Night of Fire on 12 June 1961), forcing the United Nations to intervene in the negotiations with the Italian government in Rome. After 11 years of mediation and negotiation, a resolution was reached between Austria and Italy on granting considerable self-government to South Tyrol. In 1996, the European Union approved of further integration of the Austrian state of Tyrol with the Germanic province of South Tyrol and Trentino (Welschtirol) in Italy. The city thrives on a mix of old and new high-quality intensive agriculture (including wine, fruit, and dairy products), tourism, traditional handicraft (wood, ceramics), and advanced services. Heavy industry (machinery, automotive, and steel) installed during the 1930s has now been mostly dismantled. On the downside, the local economy is very dependent on the public sector and especially the provincial government.